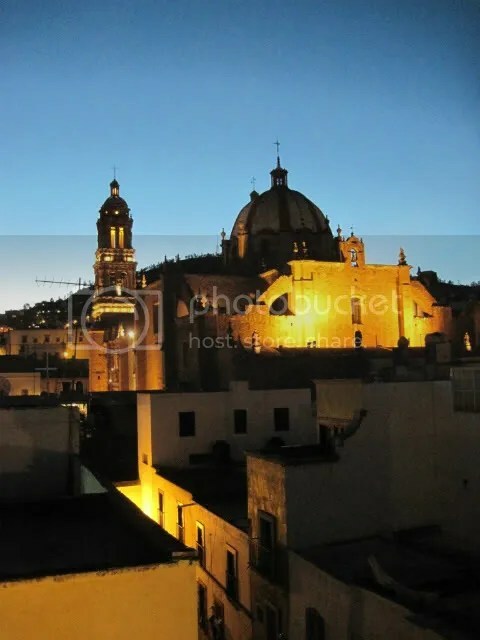 Posted on July 10, 2011, in Mellow Yellow Monday, Mexico, my digital photos, my senryu, Postcards from Paradise, Shadow Shot Sunday, Sky Watch Friday, Straight Out of the Camera Sunday, Zacatecas. Bookmark the permalink. 37 Comments. What a picture, what a thought! I feast on your wordfruit. Mellow yellow Mondays–in Mexico? Love this photo! I hadn’t heard about the mystery novels set in Bisbee. I will explore that since I am an obsessive/compulsive reader. I like the phrase Wordfruit–lovely and very archetypal. “Word made flesh” “Fruit of her womb”. delicious to heart and soul! you haiku from your recent sojourn in mexico are teaming with spirit. thank you for taking me outside the garden and planting me firmly in heaven! Wow! Beautiful photo and great haiku. Thank you for your poems! I love the golden glow on the Cathedral wall. Looks magical. Oh yes, I can see the light on! Man can not live by bread alone. Love this…the photo and the thought shared! Your words are a feast of delight for the senses! And the photo is so romantic! Fabulous photo with wonderful yellow light. Beautiful shot. Have a fabulous week! Great yellow light – nice shot! would be glad to see you there too, thanks! Gorgeous colors – blue and gold and subtle and not so subtle. Grand. What a lovely image! Love the colours. Gorgeous shot! Postcard perfect! I wonder where is this. It looks like somewhere in Israel or Russia! Thank you for visiting my entry and for dropping a comment. Beautiful light and words as usual! wow! That was an amazing photograph. I love it. Anyway, thanks for the visit and comment on SS. Oh what a great shot! I love your photo! Great shot for SWF!Have a nice weekend! Amazing! I want to be there right now with camera in hand! I love the lighting. Beautiful view and lovely verses. Happy Sky Watch!! Beautiful sky. The lighting illuminating the buildings makes it all pop! I also love the golden illumination you’ve captured here. Love the concept of wordfruit..I love words! I’ll have to send Ralph over to see this photo. Playing catch up, and this was my favorite. Just wonderful. Love the yellow light painted on the front wall of the structure.